Did you know? The largest American alligator ever reported was supposedly 19.8 feet (6 meters) long, although there are doubts about the claim. One look at these menacing predators, and it is obvious they are envoys from the distant past. They have armored, lizard-like bodies, muscular tails, and powerful jaws. The species, scientists say, is more than 150 million years old, managing to avoid extinction 65 million years ago when their prehistoric contemporaries, the dinosaurs, died off. Alligators reside nearly exclusively in the freshwater rivers, lakes, swamps, and marshes. Alligators have broad, flat, and rounded snouts, as opposed to the longer, sharper snouts of other crocodilians; also unlike other crocodilians, their lower teeth cannot be seen when their mouths are closed. Algae-laden waters produce greener alligators; alligators from waters with a lot of tannic acid from overhanging trees are often darker. Also, in alligators only the upper teeth can be seen with the jaws closed, in contrast to true crocodiles, in which upper and lower teeth can be seen. However, many individuals bear jaw deformities which complicate this means of identification. 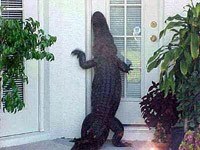 How long does an alligator live? 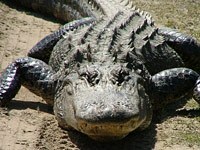 Alligators are characterized by a wider snout than crocodiles. Both living species also tend to be darker in color, often nearly black but color is very dependent on the water. Algae-laden waters produce greener alligators; alligators from waters with a lot of tannic acid from overhanging trees are often darker (although the Chinese alligator has some light patterning.) 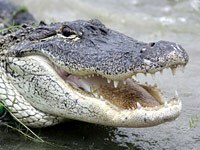 Also, in alligators only the upper teeth can be seen with the jaws closed, in contrast to true crocodiles, in which upper and lower teeth can be seen. However, many individuals bear jaw deformities which complicate this means of identification. Alligators are only native to the United States and China. American alligators are found in the southeast United States: all of Florida and Louisiana, the southern parts of Georgia, Alabama and Mississippi, coastal South and North Carolina, Eastern Texas, the southeast corner of Oklahoma and the southern tip of Arkansas. The Chinese alligator currently is found only in the Yangtze River valley and is extremely endangered, with only a few dozen believed to be left in the wild. 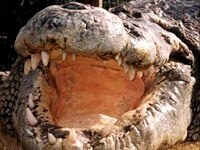 Indeed, far more Chinese alligators live in zoos around the world than can be found in the wild. The St. Augustine Alligator Farm Zoological Park has successfully reproduced Chinese Alligators and been fortunate enough to release some of their offspring back into the wild in China. What does an alligator eat? When young, they eat fish, insects, snails, crustaceans, and worms. As they grow, they take progressively larger prey items, including larger fish such as gar, turtles, various mammals, birds, antelope and other reptiles. 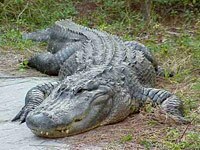 Adult alligators can take razorbacks and deer and are well known to kill and eat smaller alligators. Download free Alligator wallpapers, click on the image to open the large version. Print free Alligator coloring pages, click on the image to open the large version.